If you haven’t done so already, sign up for a family account on FamZoo.com first and order your prepaid cards or set up your IOU accounts. Need the FamZoo app for your iPhone or iPod Touch? Download it free from iTunes here. 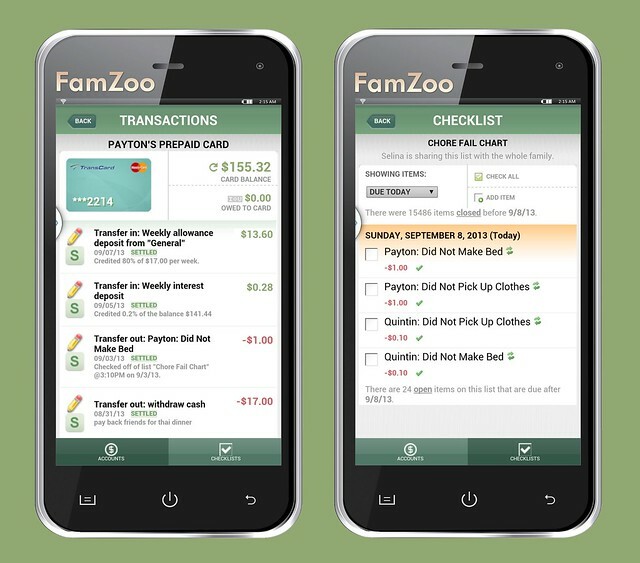 Need the FamZoo app for your Android phone? Download it free from the Google Play Store here. What Can You Teach Your Children with FamZoo? Teach your children personal finance basics, frugal living habits, responsibility, and organizational skills through consistent, hands-on practice in a private, fun environment. Teach your kids the importance of charitable giving, and how to thoughtfully evaluate charitable opportunities. Customize your virtual bank to emphasize your family’s own unique values. What Can You Do with FamZoo? Create any number of virtual bank accounts (either IOU accounts or prepaid card accounts) to track your child’s spending, saving, and giving. Schedule any number of allowances to be delivered automatically and split between your child’s virtual accounts as desired. Post chore checklists to pay for your child’s performance on specific jobs. Make savings goals to track progress toward your child’s purchases. Create collaborative budgets with your kids for specific areas of spending, like clothing and entertainment. Make loans to your children to encourage the proper long-term care and appreciation for “big ticket” items like bikes, computers, cell phones, etc. Create checklists for shopping, ToDos, gift wish-lists, homework, chores, or anything else you’d like to organize. Keep them private, or share them with the rest of your family. What Can I Expect in the Latest Version of the App? Quick access to accounts, transactions, money requests, reimbursements, and checklists.